Create a 256 by 256 px document. Make the grids visible (View > Show Grid), turn on the Snap to Grid (View > Snap to Grid) then go to Edit > Preferences > Guides & Grids. Enter “5” in the “Gridline Every:” box and “1” in the “Subdivisions” box. All these option will help you create the following shape. Select the Pen Tool(P) and create a shape like the one shown in the image belowe. Pay attention at the grids to understand the exact size for each side. Double click on this shape (in the Layer pallete) and name it “Document”. Fill “Document” with the gradient shown below image #1 then add a 1pt Stroke Aligned to the Inside (R=253 G=206 B=92) and a 5px Rounded Corners effect. Add a new fill (from the drop down menu of the Appearance pallete) for this shape and use the gradient shown below image #2. Next, reselect this shape and add the Drop Shadow effect shown below image #3. For the following steps you won’t need the grids. So, make them invisible and turn off the Snap to Grid. Continue with the Rectangle Tool(M). Create a shape like the one shown in image #1. Select it and go to Object > Path > Add Anchor Points. Now, pick the Direct Selection Tool(A) select the anchor points highlighted in image #2 and move them a few pixeld up (as shown in image #3). Use the Convert Anchor Point Tool (Shift + C) to add a bit of roundness for the top anchor point. Fill this new shape with the gradient shown below image #3 then add a new fill and use the gradient shown above image #4. Next, add the Drop Shadow and the Arc effect (Effect > Warp > Arc) shown in the following images. 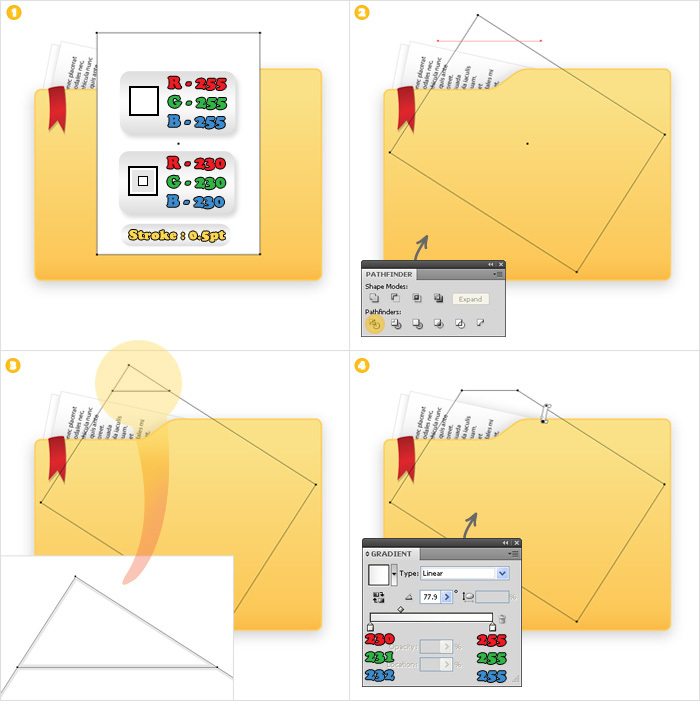 Select the Rectangle Tool(M) and create a rectangle like the one shown in image #1. Name it “File1” and for the the moment fill it with white and add a 0.5pt aligned to inside stroke (R=230 G=230 B=230). 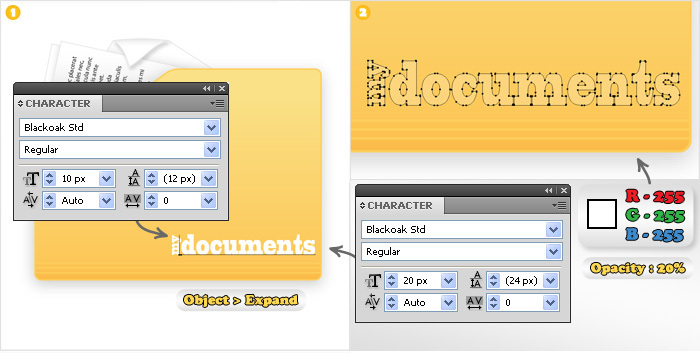 Next, select the Type Tool(T), create a text area (like in image #2) and insert a random text. Select this text and “File1”, send them to back (Shift + Ctrl + [) then rotate and place them as shown in image #3. 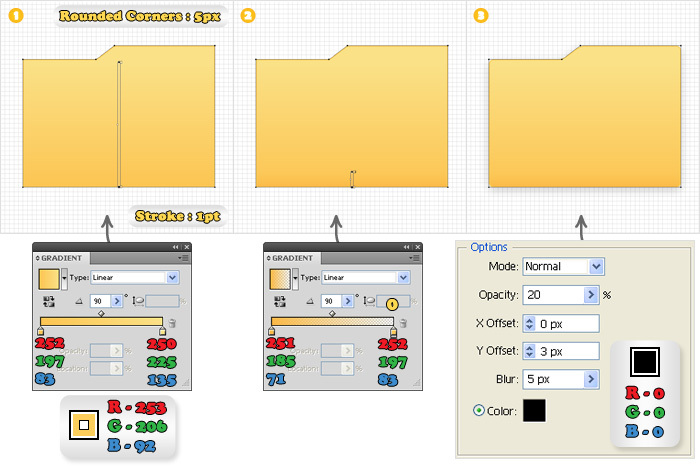 Change the fill of “File1” with the gradient shown in image #3. Create a copy of “File1”, name it “File2”, send it in the back, move it a few pixels to the left then change the angle of the gradient as shown in image #4. Select “File1” and “File2” and group them (Ctrl + G). Next you need to mask some portions of this group. Select the Rectangle Tool(M), create a shape like the one shown in image #1 (it should cover the unwanted portions) and fill it with black. 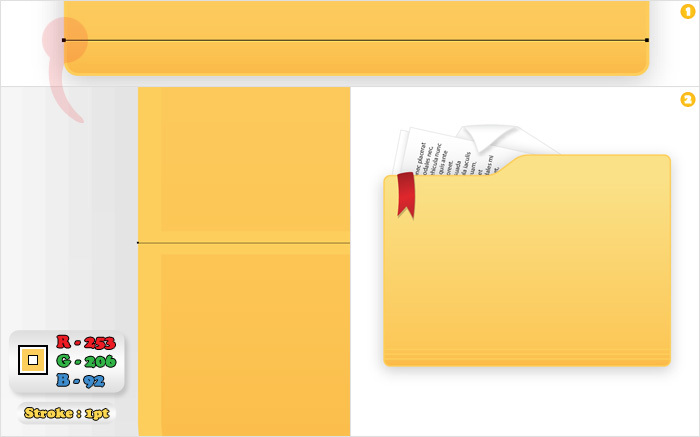 Select it along with the group (“File1” and “File2”), open the Transparency panel (Window > Transparency), open the fly-out menu then select Make Opacity Mask. Also, uncheck the Clip box from the Transparency panel. Now, the unwanted portions should be invisible. 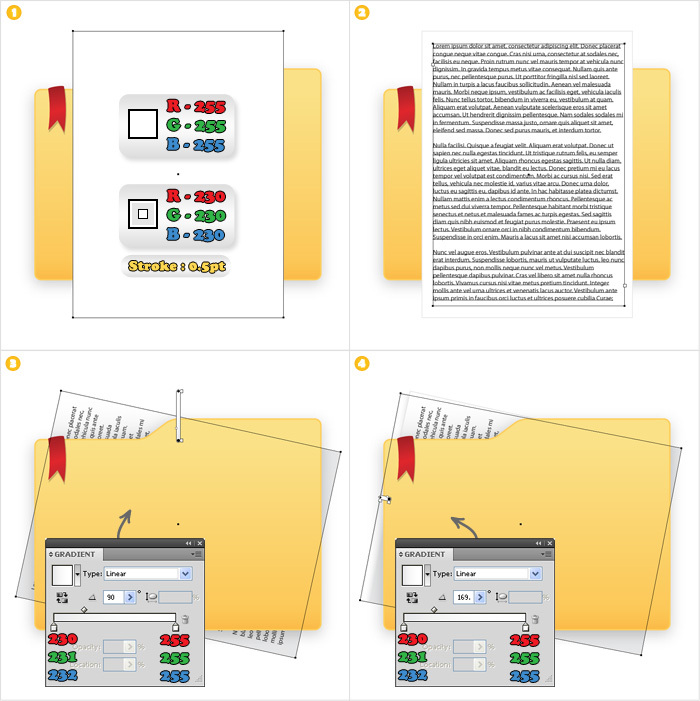 Reselect this masked group and move it below “Document” (in the Layers panel). 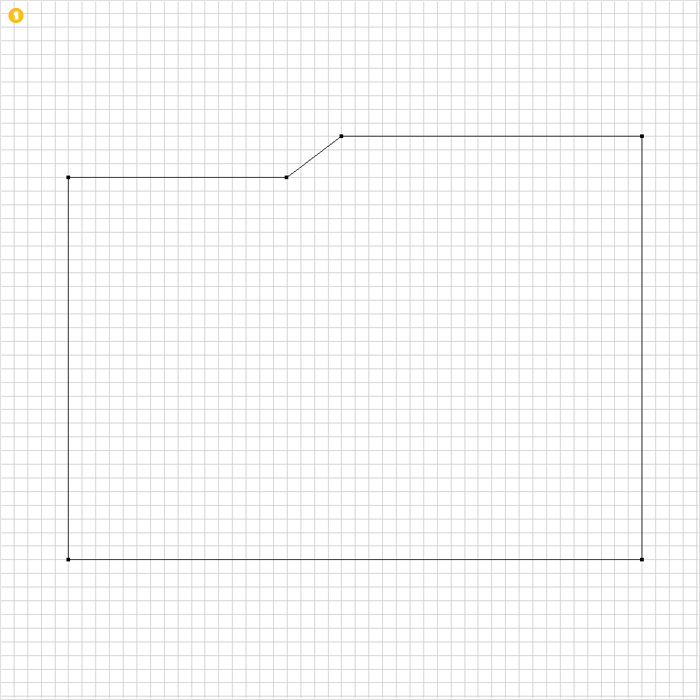 Reselect the Rectangle Tool(M) and create a shape like the one shown in image #1. For the moment fill it with white, add a 0.5pt aligned to inside stroke (R=230 G=230 B=230) then send it to back and rotate it as shown in image #2. 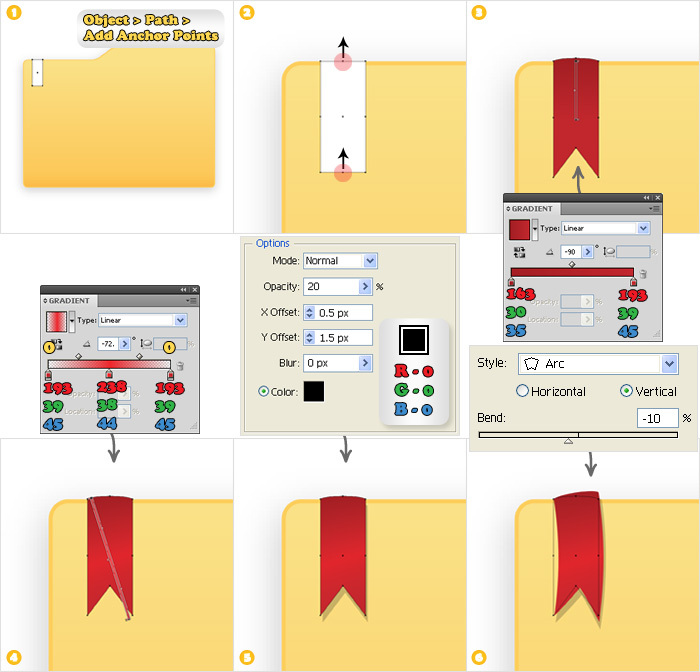 Now, you need to create a folded paper effect. 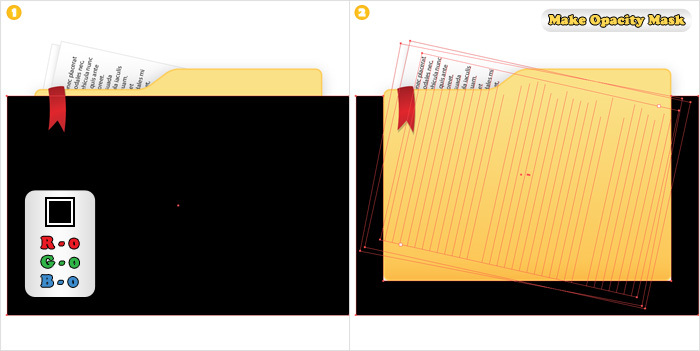 Select the Pen Tool(P) and create a horizontal path like the red one shown in image #2. Select it along with the rectangle then click on the Divide button from the Pathfinder panel. You should get two new shapes. Fill the bigger one with the gradient shown in image #4. Le’t continue with the smaller shape. Flip it vertically (with the Reflect Tool), place it as shown in image #2 then replace it’s fill with the gradient shown in image #2. 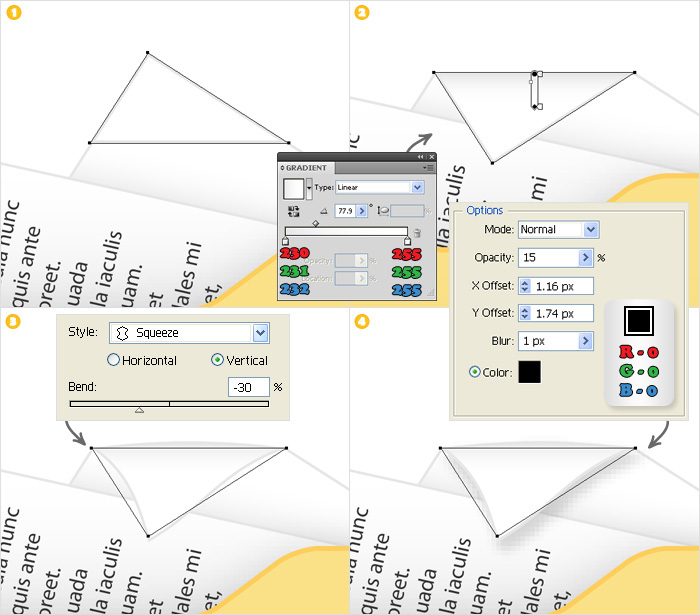 Continue by adding the Squeeze effect (Effect > Warp > Squeeze) and the Drop Shadow effect shown in the following images. For some discrete detail select the Pen Tool(P) and create three horizontal path (image #2). Use a 1pt stroke for these paths (R=253 G=206 B=292). Finally, for the text use the Blackcoak Std font. Create two texts and use the info shown in the Character palletes. Select the smaller text, rotate it 90° and place it as shown in image #1. Next, lower the opacity of this text to 20%. You cand edit, resize or expand this text as you want. Hi. This is a really cool tutorial. Beautiful Icon and great tutorial. I like it, but theres not enough differentiation at the sub 48px size. 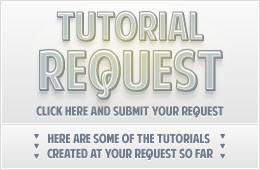 Beautiful Icon and great tutorial.Thanks for sharing! Nice tutorial, thank you for explaining fairly professionaly how to make these type of folder icons. Really cool tutorial, I like this one! Can’t get step 5 to work…also instructions say opacity mask, but pics say clipping mask…tried both…doesn’t work correctly. 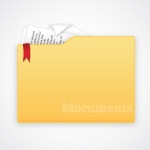 It minuses the folder part from the black rectangle…and the file1&2 group go outside the folder with the mask. Hi, you were right about the picture. I made the correction and I simplified the entire step. Read again the instructions and let me know if you get the right result.